Opera Mediaworks has taken a new approach to its data report on the state of mobile advertising and, today, has launched Mobile First Insights (MFI), a quarterly report designed to help marketers navigate the quickly changing mobile environment and make strategic decisions that will drive real outcomes for their business. The new report, which is highly visual and has more the feel of a glossy magazine than a traditional report, is organized into three sections: Data, Technology and Creativity. Opera Mediaworks examined data from hundreds of global ad campaigns and billions of impressions served on the platform and combined it with some third-party data from external sources to paint a picture of where the mobile marketing industry is today, including “where the heat is” in the mobile app market and how consumers are interacting with mobile content and advertising messages. 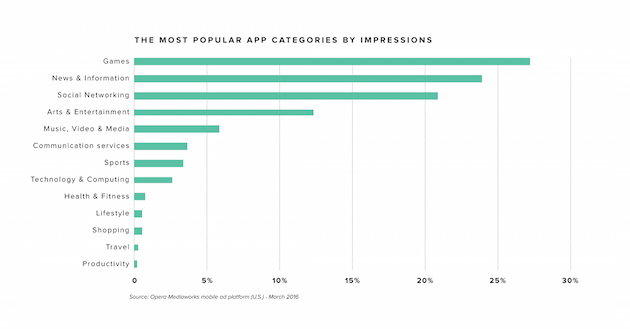 Looking at data from the top 100 apps that use Opera’s mobile ad platform to monetize their traffic, we saw that mobile users are spending about 30 minutes each in each of these popular apps with an average session length of 8.5 minutes. Gaming and broad-based entertainment categories (news, arts, music) are “must buy” categories – or, as we like to call it, “Today’s Premium” – to drive TV-sized reach and is where large amounts of time spent occurs. Numbers from the platform proved that mobile has the ability to reach TV-sized audiences with some apps such as Shazam, Ibotta and Weatherbug surpassing the reach of popular TV shows like The Walking Dead, Survivor and Scandal. Games is the top category for ad impressions and also have long average session times; ads also convert at a higher rate on Games apps than any other category. Music, Video & Media is no. 1 for engagement (as measured by clickthrough rate), followed by Travel and Lifestyle. Though the volume of impressions on mobile apps vs. mobile web are comparable, apps generate more than twice the engagement and 13.5X the revenue. Technology can mean the difference between a poorly-targeted campaign and a highly accurate one, the report found. Advertisers that work with a mobile ad platform – as opposed to directly with a media company – must be assured of direct SDK penetration in order to increase the likelihood of reaching highly targeted audiences. The Q1 report shares two mobile advertising campaigns that are prime examples of purpose-built creative, that is, creative solely made for mobile, which often leverages the native hardware and software capabilities that are built into mobile devices. How Hilton Hotels & Resorts used 360° video to give mobile users the full experience of being at their property, driving vacation bookings and other KPIs. How Stoli used haptic effects to make the shaking of a martini seem real, resulting in significant engagement and replays, as consumers were surprised and delighted by the vibration in their hands.